Manoeuverability and exceptional operator comfort are built into the Kubota SVL65-2 compact track loader. MARKHAM, Ont. – Kubota Canada is proud to announce the newest addition to its popular compact track loaders series, the SVL65-2. The new compact track loader is positioned in a lighter rated operating capacity weight class than the current SVL75-2 and the SVL95-2 models, further diversifying its construction and landscaping equipment offerings. 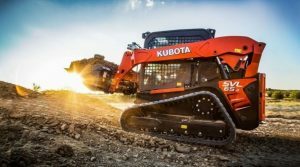 The new unit will be available in Kubota dealerships across Canada starting April 15, 2019. Designed for big jobs in tight workspaces, Kubota’s new SVL65-2 compact track loader is sure to meet the expectations of construction and landscaping entrepreneurs who have been waiting for its exciting new features that will increase their team’s efficiency. With its exceptional comfort, the new SVL65-2 will delight operators by making their work easier while providing them with superior operational control, power and performance. The SVL65-2 is powered by a 50-kW engine ready to power through any job and boasts a wide working range including a rated operating capacity of 950 kg at a 35% percent lift or 1,360 kg at a 50%, a reach of 88.65 cm and a hinge pin height of 301 cm. The standard self-leveling feature can be engaged with the flip of a switch and keeps the bucket or forks at level without the need to manually adjust the angle. Plus, multi-function levers provide control of all major vehicle and attachment operations at your fingertip. The new SVL65-2 features an advanced multifunction valve for improved multifunctional operation and allows for smooth operation when running any attachment that uses auxiliary hydraulics easy, particularly attachments such as a grapple bucket, a 4-in-1 bucket or a hydraulic auger. Consistent with the larger models in Kubota’s SVL Series, the SVL65-2 features a sliding front door – its signature and best-selling feature – that can be opened regardless of the position of the bucket or loader arm; plus, full machine operation is possible with the door open, when desired. For more information on the technical specifications of the SVL65-2, click here for the brochure or see www.Kubota.ca.